Every woman loves to receive pampering gifts that say Thank You; I Love You or You're Special. Choose from a large collection of relaxing spa baskets and lovely bath and body gifts for every special woman in your life to show her how much you care with a special gift just for her. When you want to give her a restful and relaxing gift focus on pampering gifts. What women doesn't like to be spoiled? Bath and body gift baskets include pampering products such as body creams, bath beads, fragrances and spa gifts that will delight any woman on your gift list. Every woman is delighted to receive relaxing pamper bath baskets filled with soothing lotions, scented soaps, shower gel and fragrant candles. Woman love relaxing scents and soothers. 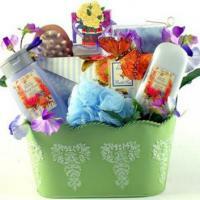 Pampered women simply look and feel younger so treat her to a relaxing bath gift basket for women today. When seeking that perfect gift for a birthday, holiday, or any time of the year, try our bath and body gifts to help your loved one relax. Bath and body gifts offer the chance to pamper your friend or loved one - or even your spouse or lover with unique spa products. These types of gifts can be given year round, and they work wonderfully for recipients of all ages. Bath and body gifts by Adorable Gift Baskets can be delivered to your recipients' home to show you care and will add a touch of elegance to your gift gestures. Our spa gifts are delightfully stuffed with all the essentials for a soothing moment of relaxation each day. Whether your loved one enjoys nightly soaks in the tub by candlelight, foot massages or just an hour of stress relief with their favorite book or music, you'll find many treasure-filled bath and body gifts to choose from while browsing our website. Bath and body gifts are typically filled with luxurious products to give your recipient a dreamy bathing experience. You'll also notice creative spa basket arrangements with inspiring gifts or fantastic boredom buster items. Adorable Gift Baskets combines some of our bath and body baskets with indulgent snacks that your recipient can enjoy while taking a break from the cares of the day. Some of our bath and body gift baskets will bring a calming "getaway" home to your recipient while others promote a warm sense of restful country living. There's a delightful spa experience for just about anyone, and many themes of enjoyment can be found within the framework of our lovely spa gift baskets. Bath and body gifts by Adorable Gift Baskets will make a pleasant surprise for anyone going through medical recovery due to illness or surgery. Lavish your mom on Mother's Day with a spa gift, or shower a bride to be with pampering products to relax her while planning for the big day. Save time and money with our great values and shipping offers. 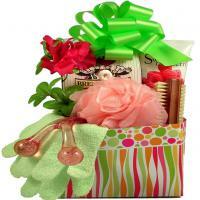 Adorable Gift Baskets simplifies the gift-giving process so you can find amazing spa gifts of the highest quality.